Bev Stanton is at it again with her electronica project. 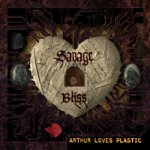 “Savage Bliss” is harder-edged than previous works by her. “Ecstasy” throbs with relentless abandon. “Monuments” is a collaboration with the group Bicycle Thieves and features lead vocals by Jon Kaplan. It’s calmer and more atmospheric than other tracks here. The aggressive “Queen of the world” is its opposite. Heather Heimbuch’s assertive vocal makes it a real winner. “Persona non Grata” sees regular collaborator Lisa Moscatiello weighing in with her velvety voice. Business as usual from the eclectic Ms Stanton then. She has made a staggering amount of music with this project, and most of it seems to be good. Comment: Bev Stanton is a true electronic music mastermind!! Illusion is my fav song from the cd…Maybe its because She used some of my loops in the track…ha ha You’re A Champion & Ecstasy are also really good tracks……..Good job bev & crew…….